To commemorate the centennial of the National University of Mexico (today known as the UNAM), Thomas Glassford has created a site-specific installation that covers the main tower of the new University Cultural Center in Tlatelolco. This—a modernist landmark was designed in 1963 by Pedro Ramírez Vásquez to house Mexico's Ministry of Foreign Affairs. A relatively invisible but intriguing web by day, the work is set aflame by night in a luminous pattern as complex as the history of the site itself. Glassford’s monumental work is a relatively invisible but intriguing web by day, which is set aflame at night in a luminous pattern as complex as the history of the site itself. 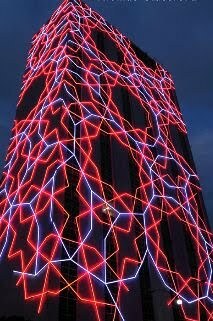 The technically and visually intricate architectural intervention covers all fourth marble façades of the building in a red and blue veil of neon-like LEDs. The geometry of the network is based on about new findings: quasi-crystals and a periodic tiling, configurations that by definition lack translational symmetry. Beyond the intricate geometries, however, Glassford was fascinated by the cultural presumptions that shaped recent studies of these forms. In the 1970s, Western scientists, including Roger Penrose, “discovered” these forms—initially as an abstract mathematical conundrum, but then —quasi-crystal formations were found to exist in nature as the crystalline substructures of atoms. However, the story is more complicated: in 2007, a Harvard doctoral student specialized in this field of physics was able to recognized the same patterns in fifteenth-century Persian architecture while traveling in through modern current day Iran in—of all things—fifteenth century Persian architecture. This medieval appearance in “medieval” architecture use of such complex forms, long unknown in the West, not only baffled the scientific community. Cultural biases prevented them from admitting that the Persians had figured it all out half a millennium before. The never-ending celebration of one culture’s accomplishments over another’s serves as a poetic parallel to the site of Glassford’s installation, situated in an urban landscape that has been defined and defiled by the presumptions of successive civilizations, all of which have converged at Tlatelolco. An important city and market center during the Aztec period, Tlatelolco remains of one of the most important pyramids archeological sites in the Valley of Mexico. Adjacent to the restored pyramids, the church and monastery of Santiago Apóstol, built in the 1530s from the wreckage of razed temples, was also the site of the College of Santa Cruz de Tlatelolco, a center of learning where Franciscan monks imposed Western Christian doctrine on their elite indigenous students, a process that would continue in the following centuries throughout the “New World”. After the construction of the Ministry of Foreign Affairs in the early 1960s, and the erection of a nationalist historical Plaza de las Tres Culturas nearby, the word “Tlatelolco” took on a new and more violent connotation after the historical student massacre took place— weeks before Mexico hosted the 1968 Summer Olympics–when the students were being congregated to start a pacific demonstration against the government. All these events occurred in the shadow of the Ministry’s tower. Appropriately, the Aztec deity Xipe Totec is alluded to through Glassford’s title. Also known as “Our Lord the Flayed One” or “Drinker of the Night,” Xipe Totec skinned himself in order to feed humanity, an act akin to maize shedding its outer layer in order to germinate—an act of rejuvenation. In the Aztec world, priests wore the complete skins of flayed warriors as symbols of regrowth, fertility and life. Likewise, Tlatelolco has been sheathed in a new skin: its capillaries glow to commemorate a new life as a cultural center—a beacon visible from any vantage point of the Valley of Mexico.